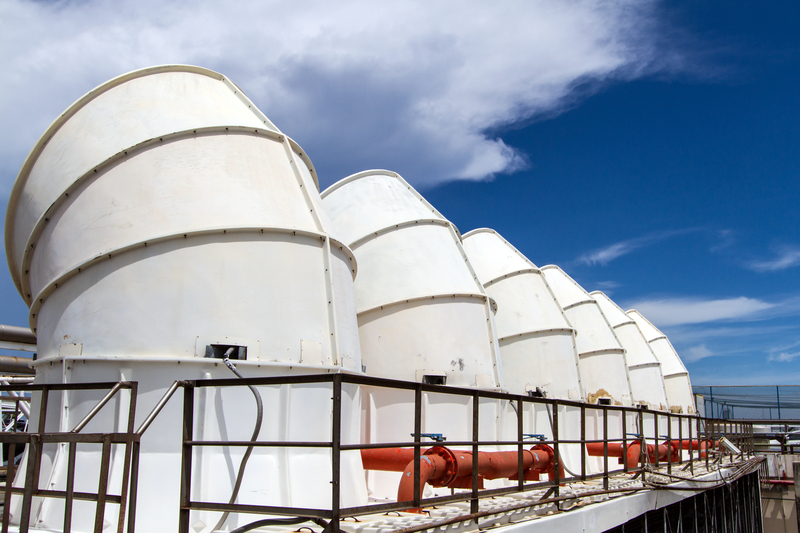 HVAC equipment is generally installed on top of the flat roofs of industrial, commercial, and institutional buildings. The maintenance personnel sometimes are exposed to danger of falling if the units are close to the roof’s edges. In this case, a guardrail system is required by Ontario Ministry of Labour Regulation 851, the Occupational Health and Safety Act. 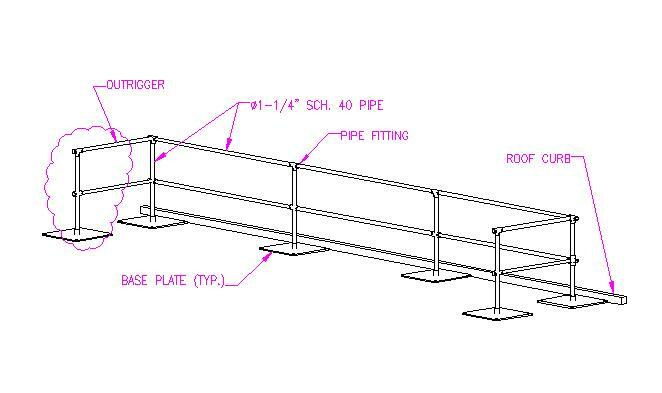 The regulation also specifies a guardrail shall be constructed to meet the structural requirements for guards as set out in Ontario Building Code (OBC), which has been adopted from the National Building Code of Canada (NBC) 4.1.5.15. Set up at the edge of the roof, these guardrail systems are laid directly on a flat roof without any anchors penetrating through. This means the stability to resist a concentrated load specified in the province’s code fully depends on its integrity and the balance weight of the base plates. B. A concentrated load of 1.0 KN applied at point for access ways to equipment platforms, contiguous stairs, and similar areas where the gathering of many people is improbable. The question is, how can one be certain a guardrail system will protect those on a roof? This article suggests an analysis option to determine structural success. A typical three-bay guardrail system is set up on a gravel protected roof. 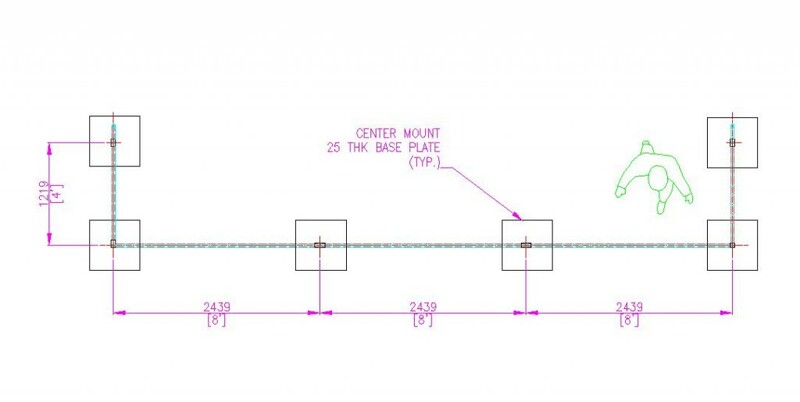 The vertical posts of the system are spaced at 2.4 mm (8 ft). The vertical posts are installed to the base plates, and a 1219-mm (48-in.) long outrigger is attached at each end to increase the system’s stability. The plan view of the guardrail system is shown below. bending moments/shear forces of every base plate are checked to determine whether the base plate fails or not. a concentrated load of 1.0 KN (unfactored) applied outward at the top rail of the system. At the beginning, the guardrail system stands there with all posts fixed. When a point load is applied and slowly increased, the first post would reach its breaking point in which the bending moment is 0.222 KN-m, or lateral shear force is 0.22 KN, then the base plate will rotate or slide. If the load increases, it will be transferred through the rails to the other base plates, which will rotate or slide—either the whole system stably stands or completely collapses. The guardrail system will change its stability mode during the loading process. Or, in other words, the analysis model will change. Therefore, the general structural analysis is unsuitable for this situation.